Three "super-Earth" planets with the capacity to have liquid water and therefore the potential for life, orbit a star 22 light-years from Earth. Gliese 667C is a well-studied nearby star, one component of a triple-star system. At least six planets orbit the star, three of them within the habitable zone where liquid surface water can exist. These three planets are expected to be tidally locked, always showing the same face to their sun as they orbit. 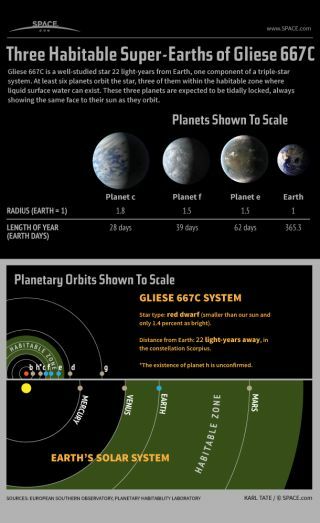 The three exoplanets within the habitable zone are called Gliese 667C c, f and e. Planet c has a radius 1.8 times that of Earth and orbits its star in 28 Earth days. Planet f has 1.5 times the Earth’s radius and orbits in 39 days. Planet e is the same size as f and orbits in 62 days. The star Gliese 667C is a red dwarf, smaller than our sun and only 1.4 percent as bright. The star’s distance from Earth is about 22 light-years, in the constellation Scorpius.